As part of the U.S. Government’s Millennium Challenge Corporation’s (MCC) extensive program to rehabilitate the Zarqa Governorate’s water and wastewater network, the Millennium Challenge Account-Jordan (MCA-Jordan) celebrated today the inauguration of the Basateen Water Station and Reservoir, a new pumping station that will meet increasing water demand within Russaifa city. 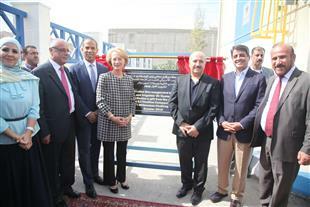 The inauguration ceremony was under the patronage of Minister of Water and Irrigation Dr. Hazim El-Nasir and U.S. Ambassador to Jordan Alice G. Wells. Attending for the MCC was the Managing Director for Compact Operations Jonathan Brooks. This new $3 million pumping station will ensure reliable and improved water supply and solve an ongoing water shortage problem for hundreds of thousands of residents of northern Russaifa city, including new neighborhoods in Yajooz area, for the coming 20 years. The new fully automated pump station, which utilizes energy efficiently, has added a 2000 m3 reservoir in addition to the old 500 m3 reservoir, as well as four pumps with a capacity of 375 m3/hour each, one of which is a standby pump that will meet the area’s needs until 2030. It has been designed to guarantee the utmost energy efficiency with a 185-meter head, while its sophisticated software means that the operator’s role will be restricted to monitoring and maintenance. The project was carried out by MCA-Jordan, a government-owned company set up in 2010 and funded by MCC, a bilateral US foreign aid agency that has also financed the new station. Through the $275 million MCC Compact grant to Jordan, MCA-Jordan rehabilitated large parts of Zarqa Governorate’s water and wastewater system. It also saw the expansion of As-Samra Wastewater Treatment Plant as well as the improvement of plumbing and the replacement of water meters for thousands of underprivileged homes that are beneficiaries of the National Aid Fund (NAF). The project’s main goal is to help the country mitigate the growing impact of water scarcity, while eradicating poverty. Also under the program, six sewer cleaning jet vehicles were procured to be granted to the Water Authority of Jordan (WAJ – Zarqa) to enhance the maintenance of the sewer system, and to sustain the new 300 km networks. The new equipment will allow Miyahuna, which operates Zarqa Governorate’s water and waste water systems, to switch from responsive maintenance to preventive maintenance of the sewer networks, thus prolonging the lifespan of the new networks. The vehicles that cost a total of $1 million were financed from the savings achieved in the Compact program in order to improve Zarqa’s environment.